Have you ever wondered who started the trend of blue for boys and pink for girls. It's become such a gender linked colour, nowadays. However, some people dare to defy these traditional colours and venture outside of the box. Jennifer Lopez is one such adventurous parent, who opted to do up her twins room in pastels instead. Their nurseries were so beautifully designed. Even as a little girl, I favoured the colour blue. I rarely owned many things that were pink. My little sister on the other hand adores and still does love pink. When I first became a new mum, I did my boy's nursery in blue. Two years later my second son came along, and he introduced the colours yellow and orange, as those were his favourite colours. Twelve years later, now I have another bouncing baby boy introduced. And he seems to favour green. So I have made his nursery, beige and green. 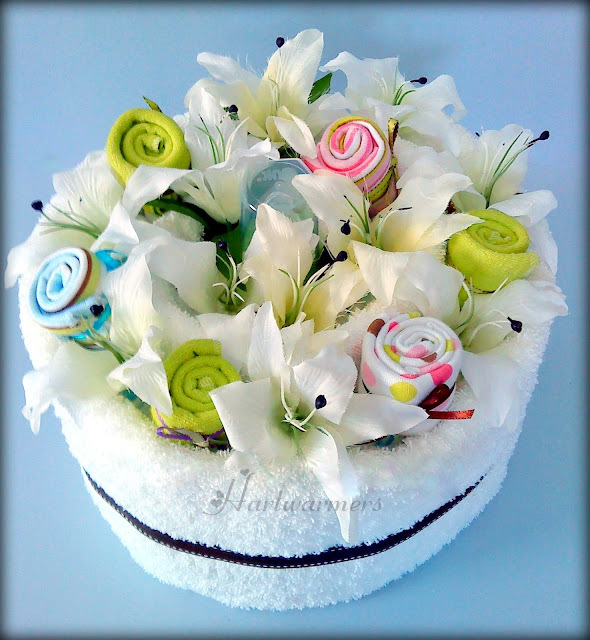 A neighbour of mine, wanted something special for a cousin's newborn, she placed an order. Her special order requested for Pink being a must. Once it was complete, I decided to call it something sweet too. This is a piece from the DOUBLE TIER DIAPER CAKE SERIES. 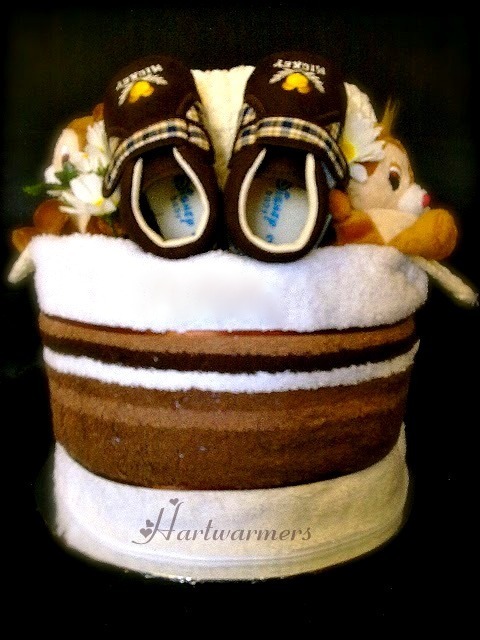 Here at Hartwarmers, all diaper cakes are carefully placed together, with as much tender loving care as possible, to ensure hygiene and durability, of the products. They are further adorned and decorated with coloured pins and designed ribbons. Upon completion, the gifts are ready to be delivered only after they are wrapped in an elegant tulle. How then could your gifts, not be a heart warmer? Techonology has come a long way and the scans that we get to have these days are really awesome. You really get to see your baby so well. So much can be said about your fetus, even before you carry him or her in your arms. With such advancement, many get to know the gender of their baby, before they arrive. Some of us choose to know and tell our loved ones, while some choose to be surprised at the delivery. It can be a little difficult trying to get a gift for a newborn, not knowing the gender. Should you find yourself in such a pickle, simply go neutral. You can never go wrong this way. I did just that, when this order came in. My client was not sure, and didn't want to pry, so we went neutral. Many a times, upon completion I email the pictures to my clients and we are good to go. In this situation, I was asked to make just a few add-ons, due to an increase in the budget. Initially, it was ordered by a friend of the couple, but later a few more wanted to share in with the gift. Here you see the Lemon Meringue, as it started out. Now you see the upgrade as I add in more goodies. and an upgrade is complete. This is a piece from the SINGLE TIER DIAPER CAKE SERIES. 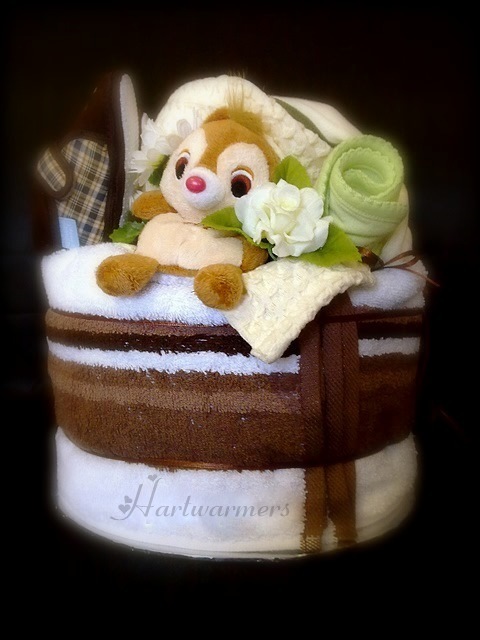 This piece started out to be a simple single tier diaper cake, that cost approximately around $65. However, a couple of friends wanted to chip in and share the gift. So they asked me to add in a couple of things from the Mothercare brand, which increased the price to S$145, to suit their budget. Big isn't always the best choice. Sometimes, simplicity paired up with elegance can make a statement. Just like this next simple, elegant piece. 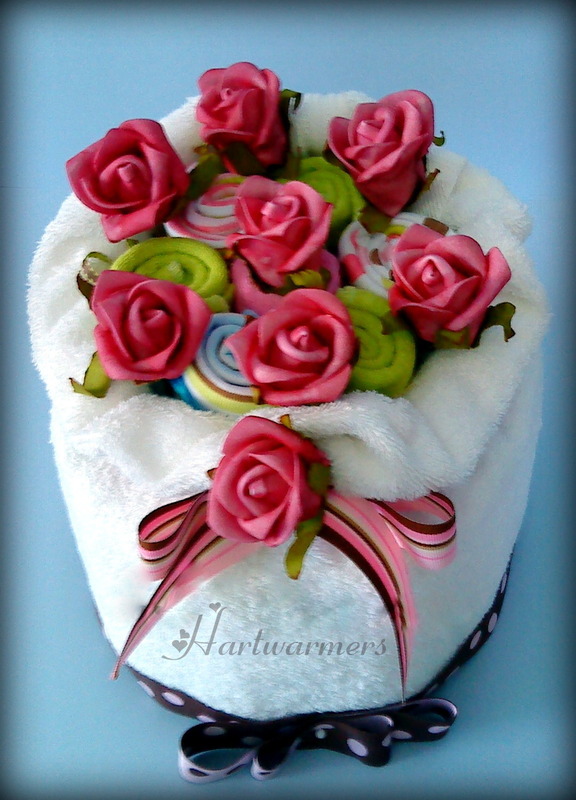 I simply love this piece, because of the pink vinatge roses, simply great for any little girl. By default I use diapers from Mamypoko, due to a good number of responds from mothers, that they are very happy using Mamypoko. However, should you have a specific preference, kindly inform before hand to allow me to cater to that. In this case, my client wanted me to use diapers for a newborn from the brand Pampers. Please do note, that when you request for Pampers brand diapers, your diaper cake will be smaller in dimensions, as compared to one made with Mamypoko diapers, which are by dimensions wider. All else stays the same. Getting a gift for someone, can be challenging. Not everyone knows what they are looking for. People sometimes have the misconception, that if its branded then, it will do. When it comes to getting my family and friends gifts, I take a while. I think about their personality, and try to recall what they fancy. Oh, course budget is yet another factor. I do like branded goods for their quality, but I do like some other things that look great and do not carry a prominent name. Some of my clients know exactly what they want. What colours? Which brands? 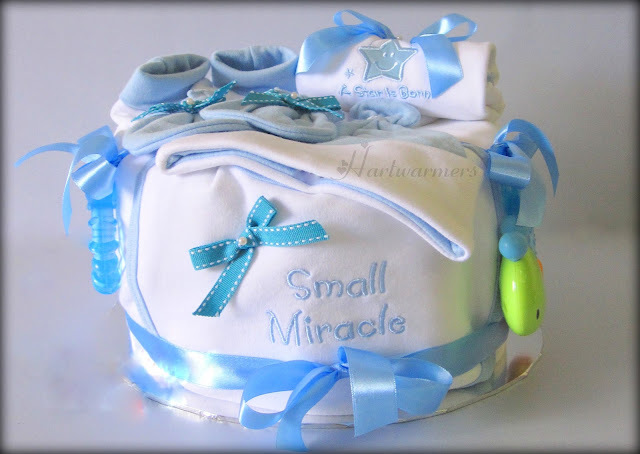 When designing your diaper cake, you could make it simple or go over the top with fancy brands. This piece was made for a client who wished for something very simple. She went down to the stores and saw a couple of gift sets. 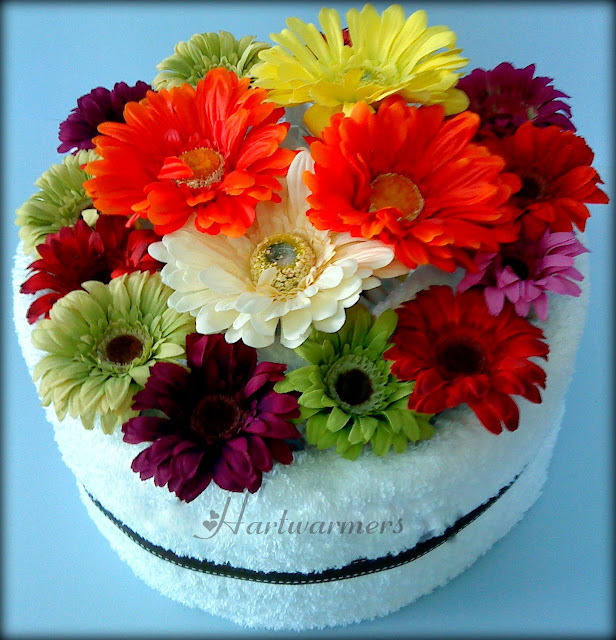 The price range wasn't very much far from our diapers cakes, but the presentation, was a vast difference. So she shared her ideas with me and I came up with this at a very affordable price. The art of giving is to give your best, and the art of receiving is to know that it came from the heart. Chocolate has always been my friend and soul mate for years now. My friend who makes me feel better after a few munches. Here is a picture of my favorite Lava Cake, one that makes everything a-okay! So obviously, my very Diaper Cake was inspired by Chocolate Cake. Then along came Chip and Dale and they appeared in line with the colour scheme. It was the first diaper cake that went out to a baby boy. During this stage, I used to get constructive criticism from family and friends, to help me along. This is another batch of cakes from the DIAPER CAKES, DOUBLE TIER CAKES. Hearing the news that you may be with child, could be the best thing that happened to you. Couples handle this news in different ways. Some like to tell the whole world, while others like to keep it a secret. And the same goes for the gender of the baby. Personally, I never like to go with the tradistionaly blue for boys and pink girls. So I like to use other fresh colours, like yellow and green. 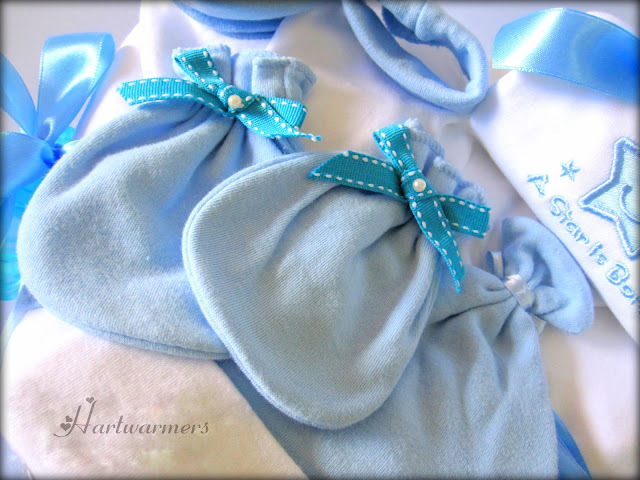 This is a yet another proud creation, for a newborn, especially if the parents-to-be wish to keep the baby's gender a secret from everyone. This is a branch out from the JUST CAKES SERIES. The JUST CAKES SERIES, was a very simple range. So I decided to play around with it and added a vibrance of colour, using colourful Gerbers.